Yarn Type A lovely chunky wool and mohair roving yarn, having the appearance of a homespun yarn. 80% merino wool, 20% kid mohair. Hand wash only. Designed by Lisa Richardson, Sarah Hatton, Georgia Farrell and Brandon Mably using Cocoon, a super soft blend of 80% wool and 20% mohair, this collection features six designs for women including comfy cardigans, sweaters and accessories. Cable stitch-detailed, cropped ladies sweater, ideal winter layer. This simple festive wreath brings a luxurious Christmas feel to any door. Created in traditional festive colours this wreath is created from pompoms, wrapped polystyrene craft balls and openwork cage balls. This wonderfully creative wreath has been made from a variety of Rowan yarn; Cocoon, Lima, Pure Linen to name but a few. However, this stash-busting project would be great to use up any leftover Rowan yarn, so have fun experimenting. Crochet this chunky homeware blanket, the member's exclusive free pattern for December 2014. Designed by Marie Wallin using the beautiful yarn Cocoon (merino wool and kid mohair), this blanket is made up of a series of striped patches and finished with a crochet trim. This girls cable cardigan, with one button detail, uses Cocoon and has been designed exclusively for the web site by Sarah Hatton. This childrens hooded jumper uses Cocoon and has been designed exclusively for the web site by Sarah Hatton. To celebrate our 30th Anniversary, Rowan designers were asked to choose one of their favourite designs from the archives and re-work it in current yarns. Martin Storey chose Morris which was originally featured in Magazine 34. A collection of 14 designs for women and men epitomizing the trend for chunky textured and graphic knits. The trend for heritage and country inspired hand knits has been important for the past few seasons and Winter 2013 is no exception. Within the Autumn Knits collection this trend influences the use of small graphic patterning, fairisle, tweed, weave effects as well as traditional cabling textures. Using the popular Cocoon, Lima and Lima Colour yarns in a soft rustic Autumnal colour palette, the designs for both women and men offer simple casual dressing with a relaxed style. Knit this easy to wear mens winter sweater with ribbed pattern details and turtle neck finish. Designed by Erika Knight, it was originally featured in Magazine 42. Knit this easy to wear loose fit ladies sweater, with cable patterning and crew neck. Ideal for winter outerwear. 16 designs by Marie Wallin and Sarah Hatton using Rowan Cocoon. We regret that this book is now out of print and have no more stocks. 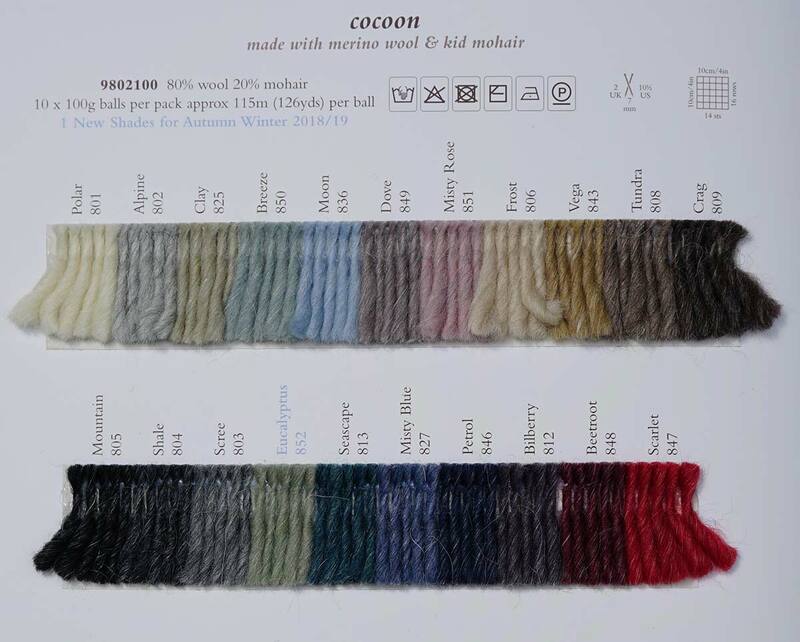 We will be happy to send a copy of any design (free of charge) with any cocoon yarn purchase.